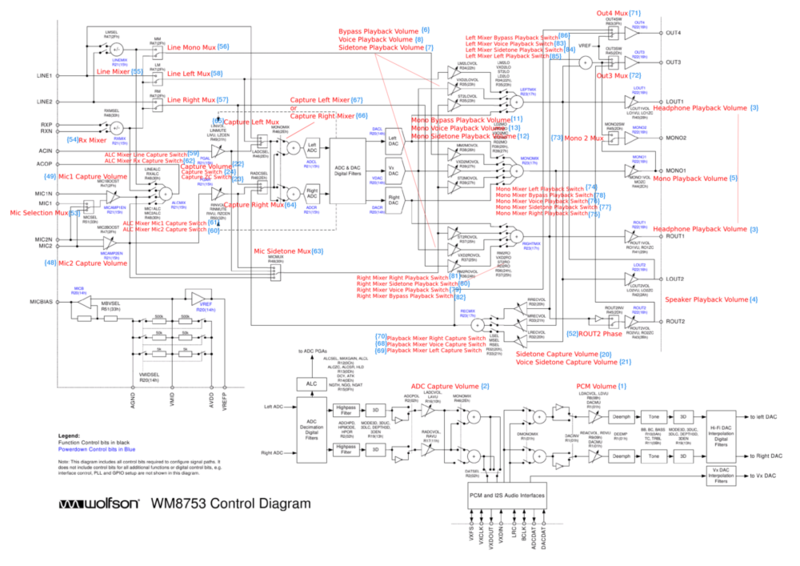 In the center of the [[Neo1973]] '''audio subsystem''' is the [[WM8753]] (the "Wolfson Codec"), which implements record (ADCs), playback (DACs), and signal mixing. On the stereo output is the [[LM4857]] amplifier, which drives the stereo speakers, the mono earpiece and the headphones. Sound from and to [[GSM]] is received from and sent to the GSM modem via analog connections. 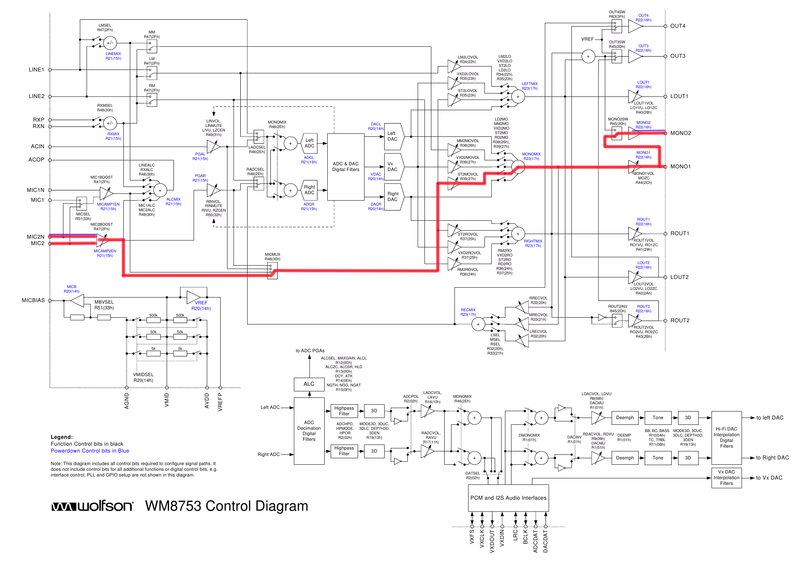 There's a digital mono interface for sound from and to the [[Bluetooth]] chip. The channel numbers shown here are for the Freerunner, not the 1973.
projected to have two dedicated controls for this. Keep in mind: left interface (VXxxx) is connected to BlueTooth, right interface (LRC, BCLK, xxxDAT) is connected to SoC (CPU). So mode "11" at least seems isn't useful at all for the way Neo HW is built. Mode "10" is suited for (Stereo/mono) output and recording for digital world, whereas Mode "00" is needed for GSM<->BT operation (calls via BT-headset) only. BT-VoIP-calls and BT-stereo-headphones playback are done via direct USB-connection SoC<->BT in a very usual standard-linux-way, and therefor need no statefile or any other setup of mixer. In my experience this works but I have to fiddle with the connection a bit before I get stereo output. The audio also comes out both the speaker and headphones. This should be supported by ASoC 0.13rc3 (-moko7 kernel) on. ASoC 0.13.3 should have same functionality but has renamed the soundcard to neo1973. NOTE none of this works with GTA02. Neo mode has disappeared, and none of the state files are GTA02 compatible. I did a lot of this debugging using [http://www.robsims.com/w8753_dump w8753_dump] which is a quick and dirty hack, but quite useful on a large text window. For example, using a voip app on the phone with a bt voice headset. This would also be a good way to work on the bluetooth driver without requiring a working GSM and placing a lot of calls. One way to do this is to use a pulse plugin for bluetooth audio. Pulse would be routed either to the plugin or the default route to the codec. The plugin would watch for headset connect/disconnect events generated by a bluez audio daemon to keep the list of available output devices current. There is early work on the bluez daemon to handle this. It has been combined with an alsa plugin in the bluez tree but the alsa plugin probably will not be sufficient for neo. It is possible to do PCM recording of a GSM voice call. 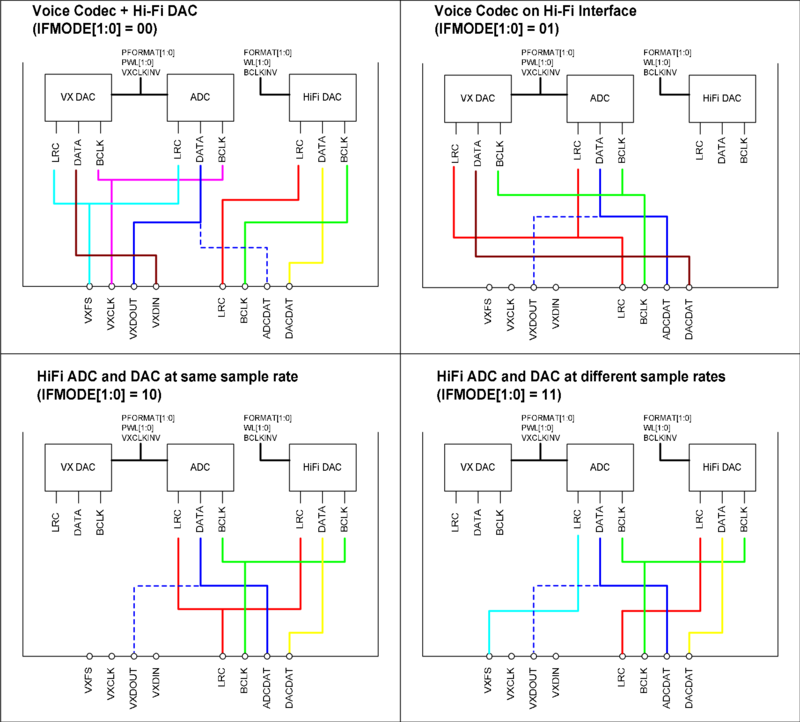 In fact, it is even possible to record the local microphone (what you speak) and the remote voice (what is spoken on the other end of the call) to separate channels (L and R of the Stereo ADC). FIXME: test this. There's currently a ASoC kernel driver bug preventing audio capture from working at all. If you want to play PCM audio into a GSM call (i.e. make your remote partner of a voice call hear your PCM audio, e.g. your mp3 or ogg files. If you have any problems you can contact me on IRC, TAsn. to the alsactl -f Callrec.txt restore command. please note that this is the state file I wrote for my [[Call Recorder]], so if you need anything you might miss here, just go and check it's source. A patch (diff gsmhandset.txt callrec-gsmhandset.txt) to apply on every state file, including gsmheadset.state and gsmspeakerout.state. 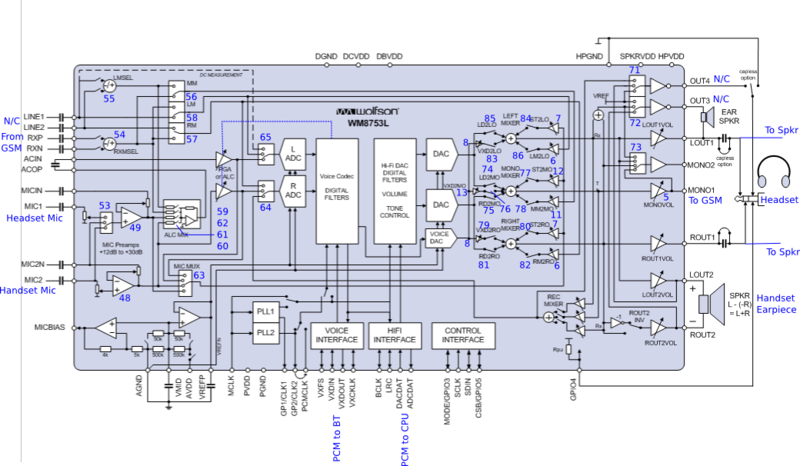 The userspace sound control deamon might be a separate process or (more likely) part of some larger general hardware management daemon. In order to provide the desired functionality, the daemon first needs to be capable of doing audio playback. * How is this management performed currently? ring tones only into the headset audio, as we must not interrupt and play it on the speaker. Reason: headset can't be switched off during playback via speaker, so to avoid extremely loud headset playback there must NOT be any speaker playback while headset is inserted. Can be an option configurable by the user. In expression: loading speakerout.state is deprecated while JACK_INSERT is asserted. 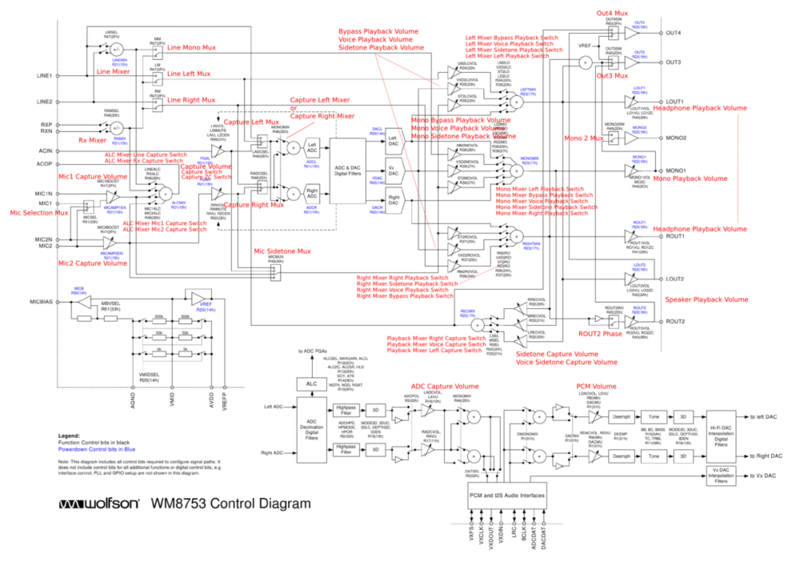 In the center of the Neo1973 audio subsystem is the WM8753 (the "Wolfson Codec"), which implements record (ADCs), playback (DACs), and signal mixing. On the stereo output is the LM4857 amplifier, which drives the stereo speakers, the mono earpiece and the headphones. 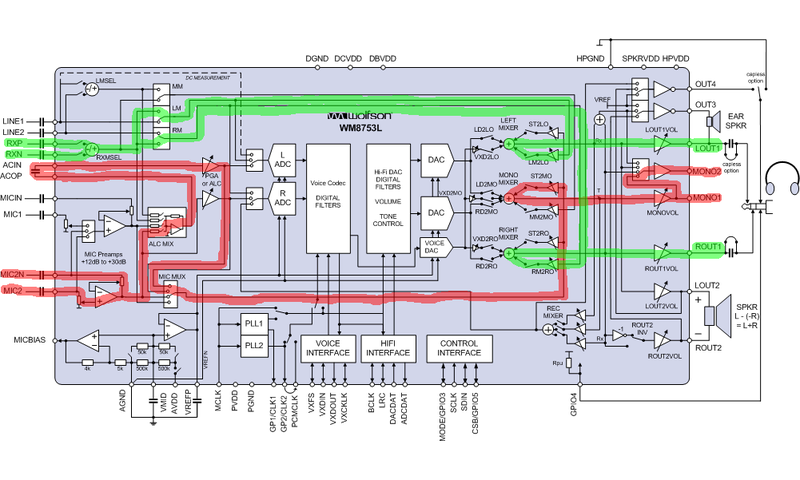 Sound from and to GSM is received from and sent to the GSM modem via analog connections. There's a digital mono interface for sound from and to the Bluetooth chip. 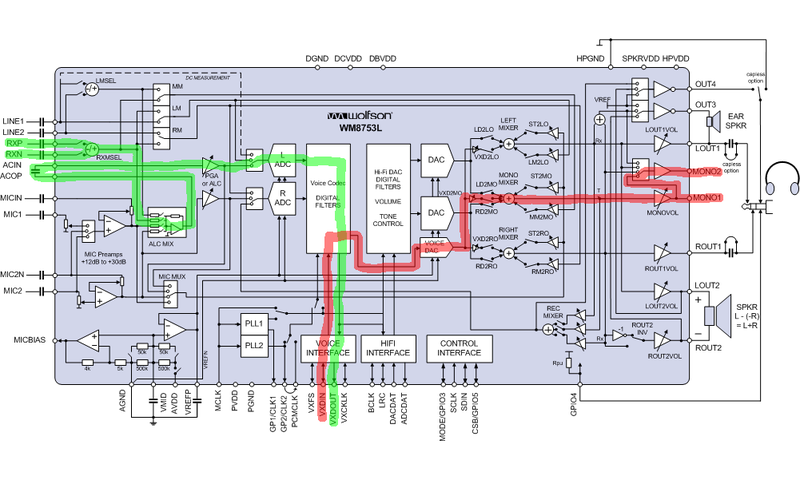 Keep in mind: left interface (VXxxx) is connected to BlueTooth, right interface (LRC, BCLK, xxxDAT) is connected to SoC (CPU). So mode "11" at least seems isn't useful at all for the way Neo HW is built. Mode "10" is suited for (Stereo/mono) output and recording for digital world, whereas Mode "00" is needed for GSM<->BT operation (calls via BT-headset) only. Example of how to setup PCM->BT link. NOTE this will not work with GTA02, as the control numbers have changed Here  is a modified version that is GTA02 compatible, But lacks the Neo Mode settings which disappeared on GTA02, and does not seem to work. The state file above does not work for me. I created one gsm_headset.txt that is working for audio playback on the freerunner. I will be updating that file as I get the mic routing working. Pair the headset ( this only needs to be done once ). If you don't hear static in your headset at this point you may need to reboot. The above did not work for me; for some reason, the hifi DAC interface must be exercised once before playing. I have hacked BtHeadset.py to make FR-BTAudio. When paired with GSMBLUETOOTH.txt I get 2-way high quality audio. I did a lot of this debugging using w8753_dump which is a quick and dirty hack, but quite useful on a large text window. See ticket 583 for a state file that should route system audio *out* to the headset. The codec does not allow for duplex system audio connected to a headset, so audio in is still using the mic. This is a nice wishlist item. The user should be able to receive the full-duplex audio from the wolfson codec, and record it using the S3C2410 IIS. Here is a state file that allows both recording and playback from and to a gsm call. please note that this is the state file I wrote for my Call Recorder, so if you need anything you might miss here, just go and check it's source. How is this management performed currently? If the user is listening to music on the headset, we want to mix the ring tones only into the headset audio, as we must not interrupt and play it on the speaker. Reason: headset can't be switched off during playback via speaker, so to avoid extremely loud headset playback there must NOT be any speaker playback while headset is inserted. If the user is listening to music on the headset, do we want to mix the ring tones only into the headset audio, or actually interrupt and play it on the speaker? This page was last modified on 1 December 2010, at 22:47. This page has been accessed 111,780 times.